What's safe to eat? How can we know? 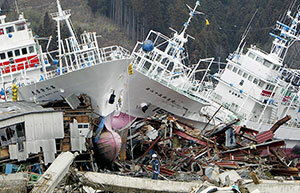 In the wake of the disaster, coastal fisheries in Fukushima and all neighboring precincts were quickly closed. Within two weeks, the Japanese government began monitoring radioactivity in fish, shellfish, and edible seaweeds. More than a year later, not because of new scientific findings or any changes in offshore conditions, but in an attempt to further reassure consumers, the government lowered the acceptable limit for radiation in fish from 500 becquerels per kilogram—already among the strictest standards in the world—to 100 Bq. Last fall, Ken Buesseler, a marine geochemist at Woods Hole Oceanographic Institution, combed through a year’s worth of data released by the Japanese fisheries agency. His analysis, published Oct. 26, 2012, in the journal Science, showed that the “vast majority” of fish being caught off Fukushima and surrounding areas had radiation levels below the tightened safe-consumption limit. Among bottom-dwelling species, however, 40 percent came in over that limit. Most important, levels of radiation in the ocean and in seafood did not appear to be declining in the 12 months following the accident. To Buesseler and others, this persistence is strong evidence of a continuing source of radiation leaking into the environment. Fish naturally lose cesium quite quickly, about 3 percent per day, if they are not re-exposed to some additional cesium source. At the same time, Buesseler acknowledged, the remaining concentrations of radionuclides in fish are generally quite low—lower than limits in force in the United States, and lower than the amount of radiation naturally present in seawater. Still, public anxiety in Japan remains high. With the exception of a few unaffected species such as whelk and octopus, fisheries remain closed off Fukushima prefecture. And disturbing outliers—individual fish with exceedingly high levels of radiation—continue to turn up. At the Fukushima and the Ocean conference in Tokyo in November 2012, experts drawn from various fields examined the issues surrounding seafood safety. Their spirited conversation ranged well beyond the science. Koji Hasebe, a journalist for the Yomiuri Shimbun daily newspaper, described a public mood crystallized in the parents of young children. Fearing internal radiation exposure, parents refused to buy milk and produce from Fukushima and nearby areas, and instead sought out foodstuffs from the west of Japan. 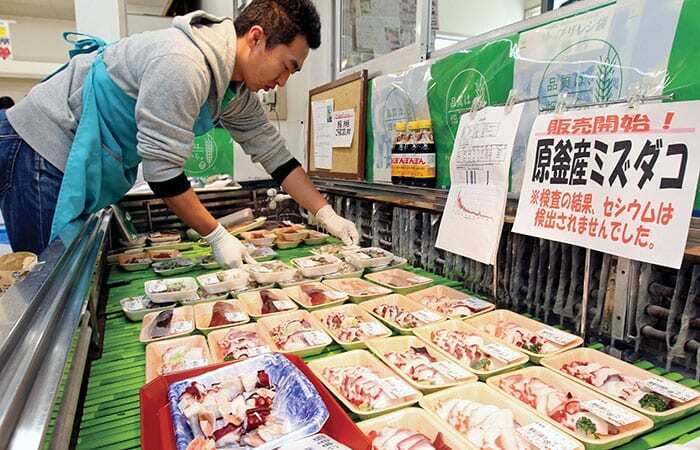 “They want to know why they must eat contaminated food,” Hasebe said. He called for improved labeling of seafood in the market to provide consumers with precise information about where fish are caught and their measured levels of contamination. Kazuo Sakai, a radiation biophysicist with Japan’s National Institute of Radiological Sciences, spoke of efforts to monitor radiation intake through daily diet. In one study by the consumer group Coop-Fukushima, he reported, 100 Fukushima households prepared an extra portion of their meals to be analyzed for radioactivity. The results showed measurable amounts of cesium in only three households, and in all cases showed that naturally occurring radiation, in the form of potassium-40, was far more prevalent. Ironically, some suggested, the Japanese government’s decision to lower acceptable radiation limits in fish may have actually heightened consumer fears instead of dampening them. Deborah Oughton, an environmental chemist and ethicist at the Norwegian University of Life Sciences, related that the Norwegian government, when faced with high radioisotope concentrations in reindeer meat as a result of Chernobyl, decided to raise acceptable limits from 600 to 6,000 becquerels per kilogram. The move was made, she explained, to protect the livelihood of the minority Sami population that depends on reindeer herding for its survival. For now, Japanese officials continue to keep fisheries off Fukushima closed, and they monitor seafood closely up and down the coast for cesium and other radioisotopes. If and when fisheries are reopened, repairing the fishing industry will require restoring public trust, conference panelists agreed. It will also demand massive rebuilding of infrastructure. This is an important context for the events of March 11, 2011, Managi said. On that day and the days that followed, sturdy construction prevented much earthquake damage inland. But the tsunami’s reach far exceeded expectations. Managi estimated a total economic loss of 5 to 7 percent of the Japanese gross domestic product. He put a figure of 2 trillion yen ($20 billion) on damage to agriculture, forests, and fisheries, with 55 percent of that hit taken by fisheries alone. Destruction of ports and shipping accounts for most of that monetary loss, he said, but he went on to argue that the figures are misleading, since the ports were overbuilt due to excessive subsidies and should be scaled down drastically. Similarly, he suggested, the surviving fleet, which he estimated at 10 to 50 percent of the before-disaster fleet, is large enough to sustain production. The more serious problem, Managi said, is that the region’s aquaculture facilities and fish-processing plants were virtually wiped out. Another pressing issue is constructing housing for displaced workers and their families. Longer term, the retention of young people in the industry is a looming concern. “The general belief is that without re-establishment of the fisheries, there can be no re-establishment of Tohoku region,” Managi said. To restore what was lost, he estimated, would require 10 years and 3 trillion to 14 trillion yen ($30 billion to $140 billion). But the industry should not be rebuilt the way it was, he argued. Instead, the government should take the opportunity to create a new, competitive fishing industry by cutting subsidies and setting market quotas. Though he has faced resistance to these ideas from those who want to preserve traditional fishing culture, Managi said, he believes that to survive, the industry must adapt. The continuing economic impact of radioactive contamination will be something on the order of 100 billion to 200 billion yen ($1 billion to $2 billion) annually, but he insisted that this impact pales before the cost of inefficiencies that crippled the industry long before Fukushima. The Fukushima disaster is without precedent and will have unprecedented impacts on future policies governing the ocean, both Japanese and international. At the Fukushima and the Ocean conference in Tokyo, Hiroyuki Nakahara, a policy expert at Yokohama National University, presented the domestic side of this equation. Japanese ocean policy, Nakahara explained, is governed by the Basic Act on Ocean Policy of 2007. The act requires a renewable five-year plan covering everything from conservation to economic development of the nation’s ocean resources. The first plan was authorized in April 2008, he said, which means the first update is due in 2013. “Intensive discussions are now under way, and include considerations for both recovery from the disaster and renewable energy development,” he said at the conference in November 2012. To respond effectively to the Fukushima disaster, Nakahara said, the next five-year plan must first include provisions for collecting, organizing, and making available the mountains of environmental data being gathered by dozens of organizations, both Japanese and foreign. Next, it must include a higher degree of cooperation between local and national governments, academia, and industry, as each of these entities continues to investigate causes and effects of the disaster. Finally, he said, the revised plan must incorporate a program for long-term monitoring of Japan’s seas. At the same time, the Fukushima accident has revealed some key shortcomings in international law, said Kentaro Nishimoto, who teaches law of the sea at Tohoku University. To illustrate, he used an incident that has brought sharp criticism from Japan’s neighbors: the intentional release of radioactive water into the sea. On April 4, 2011, some three weeks after the initial disaster, the Tokyo Electric Power Co. (TEPCO), with the Japanese government’s consent, decided to release 10,000 tons of “low-level radioactive water” to make room in its storage facilities for the huge volume of more highly contaminated water that had been used for emergency cooling of the damaged Dai-ichi reactors. “This was a minimal amount of radiation compared to the total discharge,” Nishimoto said, but the release raised a couple of legal issues, one related to the act itself and the other to Japan’s belated notification of its neighbors. In both cases, Nishimoto said, the relevant international laws proved to be nonbinding. In particular, he noted, the London Convention on marine pollution, although it expressly prohibits ocean dumping of radioactive material, limits these restrictions to vessels at sea. Release of materials from land is not considered dumping. Under the circumstances, he suggested, a regional agreement would be preferable, since neighbors who share a resource may find it easier to reach consensus. But while the Regional Seas Programme launched by the United Nations in 1974 now includes some binding conventions on land-based pollution, none of them covers the region around Japan. “This type of marine pollution has not been effectively addressed yet,” Nishimoto said.